Up in the Sierra Nevada, and now that I live in the Northern Colorado Rockies, the conditions are about as alpine and environment as you could ask for. This is the environment we wear these Lowa Mt. Expert GTX boots. Mountain Expert GTX are insulated and work perfect with crampons on any alpine terrain short of the need for oxygen and subzero temperatures. We first reviewed the LOWA Mt. 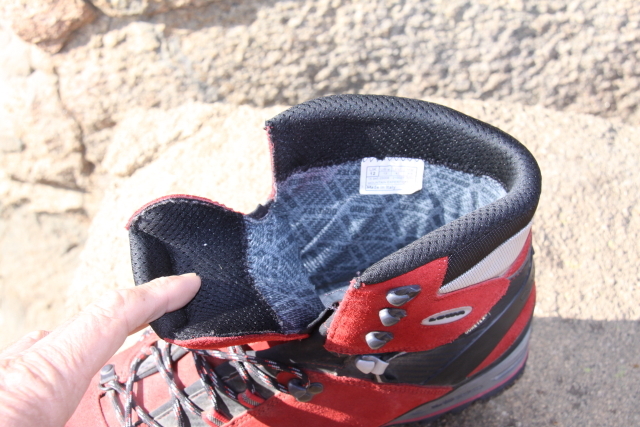 Expert GTX mountaineering boots back in 2009, and have worn them on many upper elevation treks between 9,000 and 14,000 feet elevation. After several years 0f wearing them in cool to downright freezing weather, in all manner of traction surfaces, and with crampons on, these are boots we can highly recommend you consider for your alpine gear, whether it is near-vertical assents, harsh trail conditions in high elevations, and week long backpack trips with a moderate to heavy pack. GTX are sturdy, comfortable, water tight, and warm. Ankle snapping boulders and rocks on the trail, grueling granite ascents, snow pack and peak approaches requiring crampons and glacier crossings are part and parcel of what a mountain boot has to endure. These boots are tough enough for it all, and then some. With more than 90 years building mountaineering boots, Lowa understands how to create an all-weather mountain boot regardless of the terrain and the weight in your pack. Made in Italy, the Lowa Mt. Expert GTX mountain boots are top-tier gear for high alpine treks where rocky, muddy trails and stream crossings can be treacherous. Just as important in a mountain boot is the capability of providing stability, comfort, and traction on extended treks of several days to several months carrying significant pack-weight over various terrain types from rocky, unforgiving, granite to loose shale or volcanic rock. It’s the torment of the trip length, rapidly changing weather, load weights, and variety of terrain in the higher elevations that can and will tear apart inferior boots.The first three qualities noticed in the Mt. Expert GTX was foot comfort, stability, and evident toughness. Perhaps the red and black colored split-leather uppers grab attention and seem a bit loud at first, but any misgivings where dashed simply by the design and quality of performance the Lowa Mt. Expert GTX delivered on the trail with a 40-plus pound backpack. At slightly more than 3.5-pounds a pair, the Lowa Mt. Expert GTX boots lace up snug on the foot with a single pair of boot socks and rendered a sense of the needed stiffness on the bottom, firm ankle support, and flexibility throughout the heel-to- toe-contact cycle on the ground. Although these boots appear to be on the heavy side, they are rather light; no heavier than any purpose-built mountain boot made for backpacking and serious mountaineering use. Mt.Expert GTX is Gortex-lined, but split-leather exterior uppers are almost impervious to water as seen submereged in Rock Creek, CA. However, the Mt. Expert GTX is heavy-duty and not the type of hiking boots you wear with casual clothes as you stroll down the 3rd St. Promenade in Santa Monica, California. These boots are trail boots of the caliber you lace up just before you hoist up your backpack and lock the car at the trailhead. Having worn the Mt. Experts on four separate excursions, with and without a backpack, I can tell you they required little to no break-in time. The construction and materials used to create a foot-hugging, comfortable platform to walk in yielded none of the blisters or soreness once expected from any new pair of boots. Even after a couple days of exclusively wearing these boots on the trail, the suspension, stability and traction they deliver make them a superior boot for the conditions they were worn in. Since winter is yet to arrive, these boots will be used for future trips where we will have cold, snow, and ice. However, there was lots of water crossings and muddy trail sections where I did wear these Gortex-lined boots and water intrusion, wet feet, or over-heated and sweaty feet, where not an issue with the Mt. Experts. Part of the comfort experienced with the Mt. Expert GTX can be attributed to the Lowa Flex Fit 3D approach that’s also new for 2009. Inherent in the Flex Fit is the LaceLoop where the lace-hook is not anchored to the boot upper, but rather suspended on tough fabric loops that allow the boot laces to be securely fastened over the top of the foot, yet able to flex with the motion of travel. Flex Fit 3D allows the ankle to flex naturally while maintaining the boot stability. 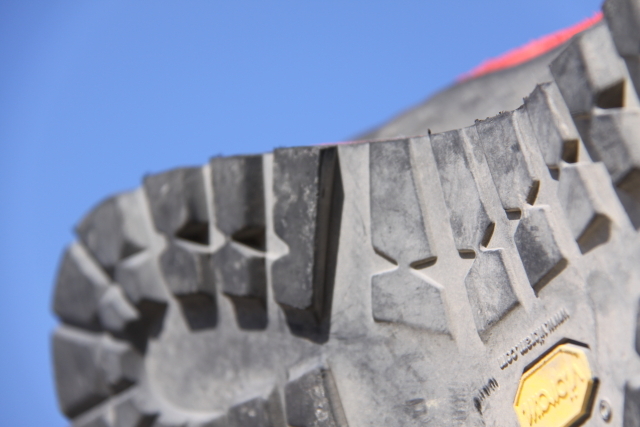 An all-purpose mountain boot requires a rigid out sole for difficult, demanding terrain. The Mt. Expert GTX is shod with a Vibram Mulaz semi-rigid outsole with rigid toe push-off zones for accurate and stable foot placement. These Vibram soles are step-in crampon compatible, self-cleaning, and use an undercut heel front section to assure positive grip on any mountain surface you might find yourself working on. A more expensive Poly Urethane midsole absorbs shock and works with a full-length plastic stabilizer in each boot. The soles are cemented to the Mt. Expert GTX uppers and are fully replaceable; an uncommon feature amongst current manufacturing trends. Lowa uses patented Gor-Tex waterproof lining in the Mt. Expert GTX for a comfortable and smooth fit which lessens the likelihood for blisters and sore feet. Climate-control footbeds, a C4 comfort tongue, and Primaloft insulation combine to make the Mt. Expert GTX extremely comfortable for such an extreme boot. The Gor-Tex lining runs up to just below the second-from-the top lace hook, and almost the full-length of the tongue. Sure, there’s going to be trips where you’ll have to wear your knee-length gators for deep-snow and water-crossings. But the way the tongue, Gortex-lining, and tongue fold are designed, the Mt. Experts will keep your feet dry in most any conditions just like they come from Italy. Bear in mind, the split-leather uppers are fairly impervious to water all by themselves. 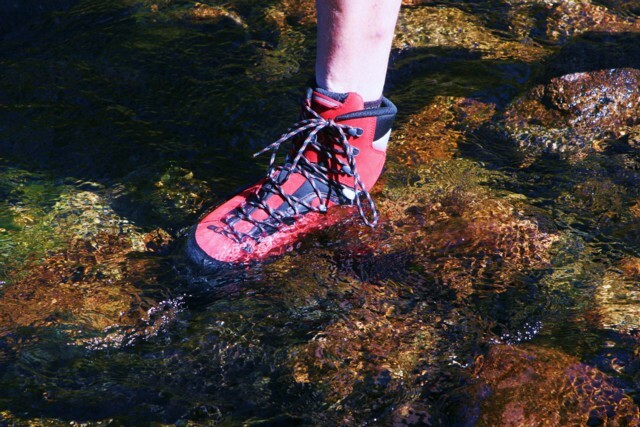 Check out the photo of the GTX boots submerged in Rock Creek to note the uppers do a good job long before the Gor-tex comes into play; yet these boots can breathe. Starting from the 10,300-foot elevation at the Mosquito Flats trailhead on the Morgan Pass trail, I hiked up the Little Lakes Valley to Mono Pass (12,000 ft. elevation) and spent a night at Chicken Foot Lake sitting at 11,100 feet. 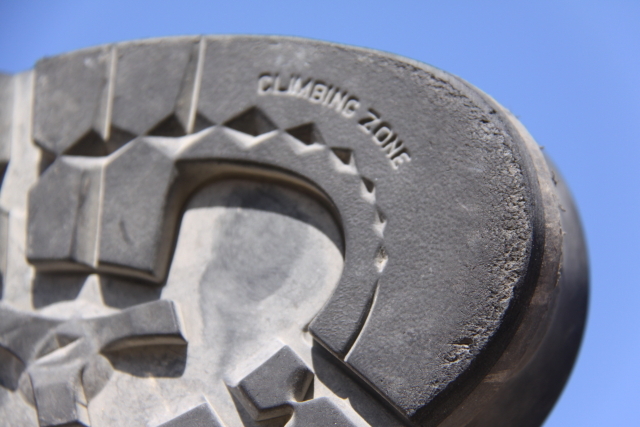 Toe section is rigid to assure your foot stability as you push-off. Walking from the lower paved parking lot about a half-mile from the trailhead, the Mt. Expert GTX boots let you know you’re walking on an even surface as the soles are firm, like ski boots. As soon as I embarked on the rock-strewn trail, the Lowa’s hit their stride up Crank Case Hill, across several stream sections and stair-steps where logs and boulders are used to shore up the trail and offer pack horses a hoof-hold. Sections of the trail are fairly steep and sometimes lengthy. Small to large rocks are part of the dusty crushed granite soil where there’s more opportunities to twist an ankle between two-rocks than not. It’s a trail mountain bikers would have to walk up most, if not the entire way. Arriving at Chicken Foot Lake (5.8 miles from trailhead) early in the afternoon, I had enough time to un-shoulder the Lowe-alpine FTX Cerro Torre backpack, pitch the Hilleberg Kaitum 3 tent, set up camp, and explore the granite slides cascading down from the peaks surrounding Chicken Foot Lake. Without the weight of the pack, the Mt. Expert GTX were every bit as comfortable and stable as they were under a full backpack. Although I was not fully acclimated to the altitude, and had to pay attention to my physical exertion levels, I did climb and tested traction in several steep rocky approaches to the peaks. Note the undercut heel for bite and traction lugs throughout the foot arch. There are approach sections to the Pacific Crest Trail in the San Bernardino Mountains and the Angeles National Forest where the terrain is steep and rocky; approaches such as the Windy Gap Trail out of Crystal Lake, CA. But for the most part, the trail is smooth going. On this type of trail surface, the Mt. Expert simply allowed long-gated strides where the heel touches down and the toe-follows up. At a rather quick pace, with a full pack, the Lowa boots offered momentum and the ability to cover ground in comfort. In general, the Lowa Mt. 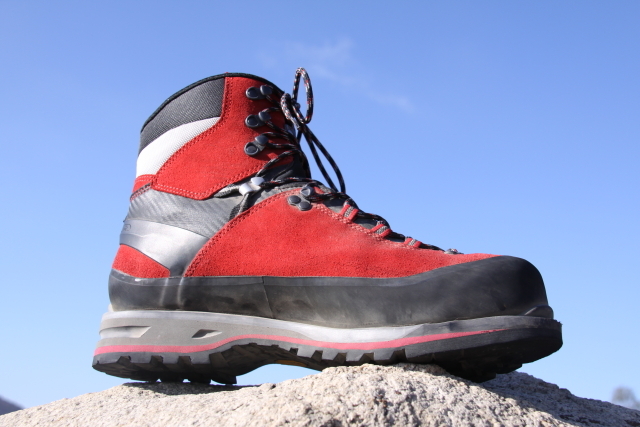 Expert GTX boots are, as they tested, highly capable mountaineering boots that are hard to beat where traction, rugged construction, quality, comfort, and longevity or desired characteristics. As has been stated above, these boots are not casual shoes you can wear around town or even drive your vehicle with these rockets on your feet. They are designed for severe use in severe conditions and wicked weather. One aspect most valued regarding the manufacturer is that they are Italian made shoes, crafted by alpine craftsmen in an alpine country, for alpine purposes. These are not “pretender” boots. They are the real deal. It would have been great to see a broader size range made available for the Mt. Expert GTX, as it would to have a more neutral color scheme. Yet these objections are negligible and subjective to individual needs and taste. When it comes to boots or running shoes of any size, I seek a size 14 U.S. fit so I can wear two-pair of socks and have room for foot swelling on long hikes. To my surprise and relief, these boots fit so well that my usual U.S. size 13 feet (size the boots came in) were never in jeopardy of being uncomfortable. Neither of the above less-than perfect observations would deter me from buying or recommending the Lowa Mt. Expert GTX as a next-generation mountain boot of the highest order. Gortex lining enhances boot-fit in addition to a waterproof barrier. Note the tongue folds that also prevents water from surging into the boot.